Input Capital is the world’s first agricultural streaming company. Founded in 2012 and headquartered in Regina, Input Capital buys and sells canola from Prairie farmers via multi-year streaming contracts. We are a publicly traded company listed on the Toronto Venture Exchange (TSXV: INP). What is a Mortgage Stream and a Marketing Stream? Mortgage Streams look and feel like your existing conventional farm mortgage offered by your bank or credit union, but with some key benefits that add value for you. Imagine making your mortgage payments only once a year, after harvest, with canola. The Mortgage Stream offers a competitive alternative to traditional mortgage products. Marketing Streams are a new way to market your canola. 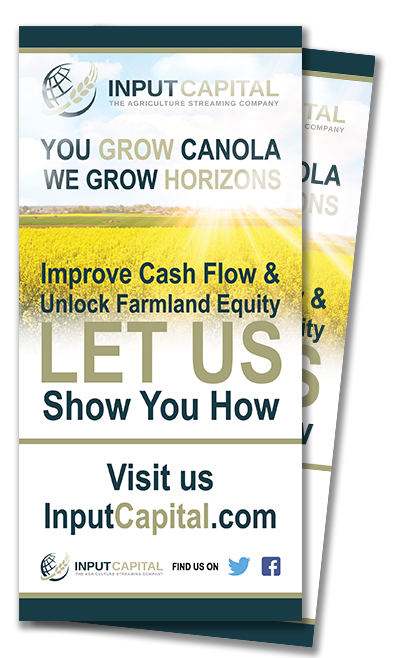 Access better canola marketing opportunities by joining Input Capital’s canola marketing program. We are the only grain company that will write you a cheque today for the right to market your canola tomorrow. How do I know I will get paid for my contract? In the vast majority of our contracts, Input Capital pays you before you deliver canola. Input Capital is licensed and bonded by the Canadian Grain Commission, so you can rest easy knowing that you are going to get paid. What are the security requirements for a streaming contract? For streams in which Input Capital provides a cash deposit, security on farmland is required to prevent non-delivery of the canola. Typically, a mortgage registration against farm real estate is required. What are the costs associated with signing up a streaming contract? All costs for due diligence and contract registration are paid for by Input Capital for all streams except Mortgage Streams. Mortgage Streams do have some fees that are the responsibility of the farmer. Does Input Capital buy canola in my area? Yes, with over 450 contracts to date, Input Capital has more than 455,000 tonnes of canola under contract across Manitoba, Saskatchewan, and Alberta. You can call us at our Head Office in Regina and we will gladly answer your questions. We also have Streaming Sales Representatives throughout the canola growing regions. One will visit you on your farm and work with you to advise on the best use of our program and get you the cash and marketing help you need right away. You and your Streaming Sales Representative will walk through the options and help you find a way to make streaming work for you.